Hi Debbie, thanks for the idea. I took my kids for the first time to the Home Depot kids workshop and we had a great time. 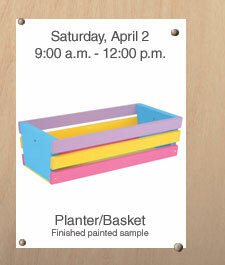 The planter lookes different than the one pic you posted but it makes a good pencil box. Too small for planting but the kids painted them so pretty that they did not want any soil in them, anyway. Thanks for the idea!